TWO men with spinal cord injuries have won insurance pay-outs for revolutionary robotic walking aids. Ben Barnes, 30, who was paralysed four years ago in a road traffic accident, has become the first recipient of a British High Court damages settlement to pay for a REX, the robot that enhances the mobility of wheelchair users. Included in Mr Barnes’ settlement was £550,000 to cover the purchase of a REX robot, its replacements and associated costs. He was represented by Ben Rogers, partner at Stewarts Law LLP, who was able to show that the REX would be beneficial to Ben Barnes’ health and sense of well-being. Mr Barnes said: “Having been told I would never walk again, you can understand my excitement when I first heard about REX and the freedom it provides for people like me with paralysis. In a separate case, a man who sustained spinal cord damage as a result of alleged clinical negligence has been provided with interim funding for an intensive course of robot-assisted physiotherapy with REX, pending a final settlement of the insurance claim. 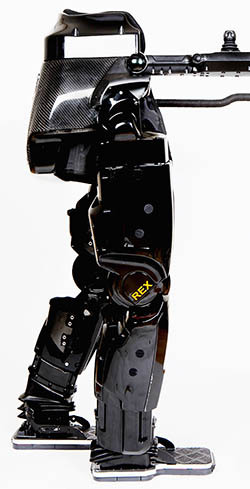 Crispin Simon, CEO at Rex Bionics, said: “These awards are an endorsement from the courts and from the insurance industry, of the principle that the REX robot technology can enable people with spinal cord injuries to remain healthy, and to resume activities they may have thought were no longer available to them. Previous articleSteve Morgan donates new delivery van to All Together NOW!